The skilful general Gaius Marius turned the Roman army into a war machine of fully armored professional soldiers (credit: Εrmine Street Guard Roman Reenactment Society). In 113 BC a great threat appeared in the horizon of the Roman world: the Cimbri and the Teutones. The ancient writers usually consider these two peoples as Germanic, but their leaders had Gallic/Celtic names (Boiorix, Lugius, Gaesorix etc) or Celtisized (Claodicus) and their arms and armor were clearly Celtic. Plutarch mentions, in an episode of his narrative about the Cimbri-Teutones invasions, that the Cimbri descended quickly the slopes of the Alps using their shields as sleds – therefore these shields were of the large Gallic thyroid type rather than the small and weak Germanic type. 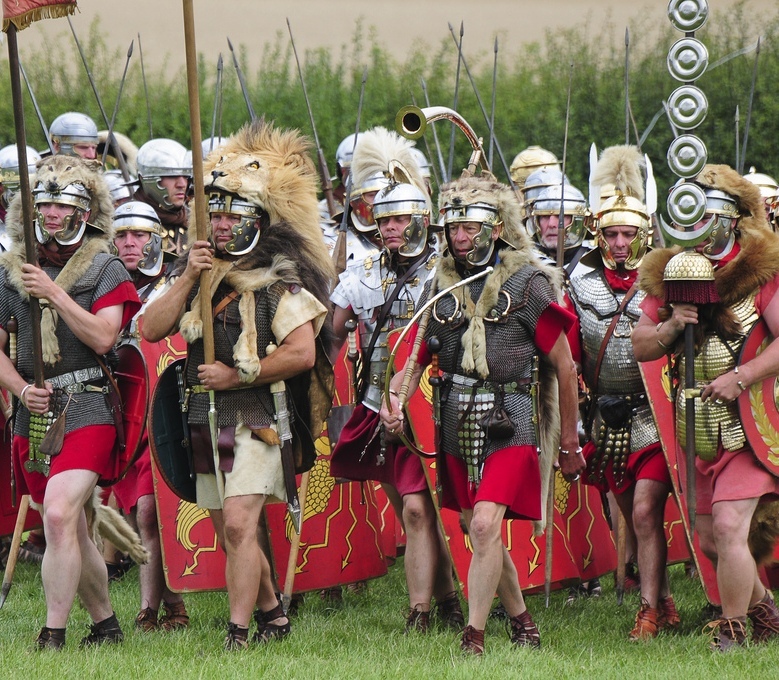 When the Roman officer Sertorius was sent by Marius to spy the Cimbrian camp, he wore Celtic clothes and learned the Gallic/Celtic language in preparation for his mission. The tribal name “Cimbri” is of Celtic origin and the word (and verbal prefix) “Teuton-” (meaning “people” and “army”) was used equally by Celts and Germans (apparently a verbal type of Proto-Indo-European extraction). These are just some of the evidence that led many researchers of the 20th century to consider the two tribes as Celtic peoples mistaken by the Romans to be Germanic. However, the ancient writers mention their homeland, the Cimbrian Peninsula (modern Jutland), a region undoubtedly Germanic in antiquity. In addition, the Massaliot Greek navigator Pytheas had found the Teutones living on an island in the Baltic Sea (4th century BC): the Baltic coastal areas have never been Celtic. Map of Germany according to the Geography of Claudius Ptolemy. 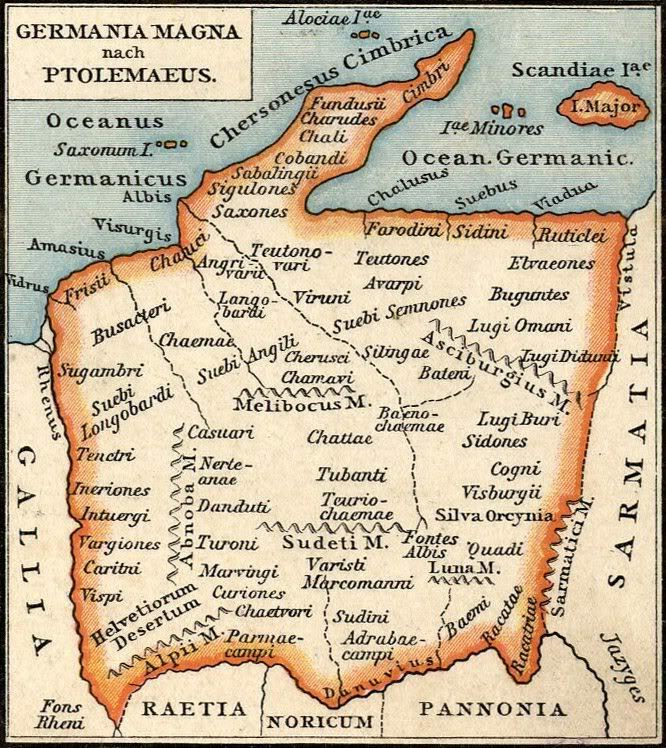 We can see the remaining Cimbri at the northern ends of the land (in ‘Chersonesus Cimbrica’, modern Jutland) and the remaining Teutones somewhere in modern Northeastern Germany. In my opinion, a proposed “middle solution” gives the answer to the enigma of the ethnological origins of the Cimbri and Teutones. Both of them were Germanic peoples of Jutland, who had already adopted there some elements of the Celtic civilization. During their interminable wanderings towards the Mediterranean South, they were joined by many Gallic/Celtic Central European groups and tribes who, due to their significantly higher civilization, managed to become the leaders of these peoples/tribal unions. This situation explains the Celtic language of the Cimbri and the Teutons (when they confronted the Romans), their Celtic names and weapons, as well as their exclusively Celtic cavalry as it is evidenced by its description. The barbarian cavalry of this period consisted generally of wealthy/noble warriors. Among the Cimbri and Teuton warriors, the Celts were almost the only ones who had horses fit for battle. In conclusion, when the two peoples appeared in the Mediterranean, they had become tribal unions of Celtic, Germanic and Pregermanic (possibly Pre-Indo-European) tribes, with the Celtic groups to be the leading ones and probably the more numerous in population. That is why the Völkerwanderung of the Cimbri and the Teutones consist a part of both the Celtic and the Germanic history. Both peoples have left their homeland in Jutland, due to climate change and overpopulation. The same reasons forced various Gallic/Celtic and PreGermanic groups to join them. In 115-113 BC the Cimbri tried to settle sequentially in the countries of several Danubian Celtic peoples, the Boii, the Scordisci and the Taurisci (of Noricum), but they were repelled by them. But they managed to threaten dangerously Noreia (modern Neumarkt), the largest fortified city (oppidum) of Noricum (modern Western Austria). Rome sent a consular army under the consul Carbo, in Noreia because this Celtic ‘oppidum’ was a geo-strategic barrier on the invasion route to Italy. The ‘Völkerwanderung’ of the Cimbri-Teutons. The Cimbri crushed the Roman army and the overweening Carbo who had refused any discussion with them, committed suicide drinking poison. Surprisingly the Cimbri did not invade Italy and decided to return to the North, possibly considering that they were not still strong enough for such an attempt. In the years 113-111 BC they were reinforced by incorporating allied Celtic tribes. 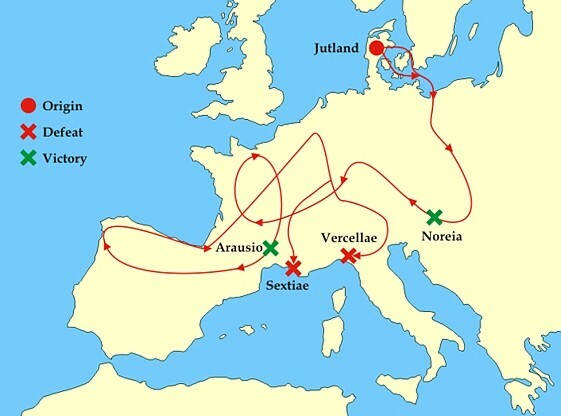 In 111 BC the Cimbri crossed the Rhine and marched in Greater Gaul (modern France), in the Rhone valley, where they convinced more Celtic/Gallic tribes to join them. The Romans were concerned about the integrity of Narbonesia (Narbonensis), their province in Southern Gaul (modern Provence). The Cimbri asked Silanus, the provincial governor of Narbonesia, for fertile lands for settling in order to avoid war (109 BC). Silanus informed the Senate about the Cimbrian request. The Senate ordered him impoliticly to stop any debate with the barbarians and attack them immediately. The governor attacked the Cimbri who did not find it difficult to massacre his army. It was the second Roman army exterminated by the invaders from the North, a fact that led to a general mobilization of the Central European tribes against Rome. In 107 BC the Teutones and several Celtic tribes (Tigurini, Ambrones, Arverni et al.) joined the Cimbri. Rome sent another consular army under Longinus against the invaders. Longinus managed to isolate the formidable Tigurini by maneuvering on the march, and began pursuing them. He did not suspect that Divicon, the Tigurinian warlord, was leading him in an ambush in the valley of the Garrone river. In the land of the Nitiobriges, the Tigurini stopped suddenly their feigned retreat and attacked furiously the Roman army. Longinus was killed, his army was decimated and the survivors surrendered to Divico. Fifty years later, the brainy Celt was still alive when he met Julius Caesar in the coalition of the Helvetii. Meanwhile, a Roman army under the consul Caepion subjugated the rebellious Tectosages of Tolosa (modern Toulouse). The Senate appointed Caepion as the provincial governor of Narbonesia, and in 105 BC sent to his aid another Roman army under Gaius Manlius. Marius was a professional soldier who had risen in the hierarchy due to his abilities. Caepion held his office due to his aristocratic origins and he despised Manlius. On the other hand Manlius believed that Caepion was a fool. Soon the two Romans came to dispute about their moves against the Cimbri-Teutones. Manlius contended that they had to attack the barbarians immediately, while Caepion insisted that they had to wait for the right opportunity. Manlius sent his lieutenant Scaurus with a reconnaissance detachment to spy the invaders, a move that Caepion considered as a strategic error. Their continuous disagreements proved fatal when the Cimbri-Teutones attacked by surprise and wiped out Scaurus’ detachment. Then they immediately attacked Caepion’s legionnaires in Arausio and massacred them. Shortly afterwards, the Northerners met the army of Manlius. The Romans were trapped having the Rhone in their backs, and fought bravely until they were decimated (105 BC). Both Roman generals were rescued but the City of the She-wolf lost two more large armies because of the northern invaders. Five Roman armies of a probable total figure of 100,000 men or more were destroyed. Terror seized Rome and her citizens fell into panic, remembering the fall of their city to the Sennonian Gauls in 387/6 BC. Besides, the Gauls/Celts constituted a major proportion of the new barbarian threat.